I know I am still to announce the winner of the Side Dish Mela, it's all done, just waiting for next week to do that along with Round up. Meanwhile I thought I might as well go ahead with the next Mela Edition. Cakes are always a favorite dish with kids. Cakes were one of those first things I started my cooking with and those days I never knew about eggless baking. So all my cakes had egg and I would never eat any of those. I saw my friends enjoying each and every bit of it. Now after a decade with the knowledge of baking eggless, there has been no turning over. I only bake eggless, just so that I can taste. And mostly it ends up being chocolate flavours. 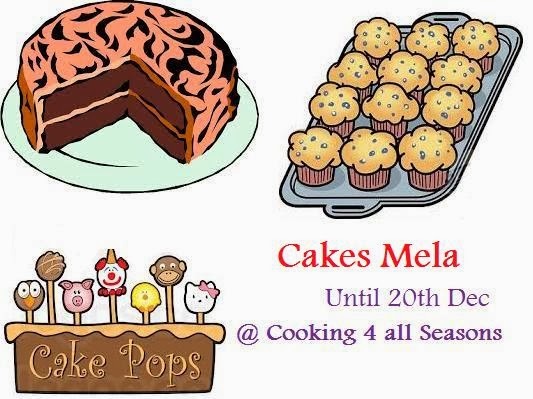 Coming to the Mela for this edition, you can send me any cake. It can be cakes, cupcakes, muffins, brownies, cake pops and Ice cream cakes too. It can also be a savory cake as well. Though I won't accept cookies or other baked dishes. Since I have never really found a major difference between loaf and a cake, at least with the ones we bake at home, I will accept that as well. So from today until December 20th you can send them to me. Make sure you bake your Christmas cakes ahead for me! *Logo is created using free images, credit to the source. What's a mela without a giveaway. For this edition, befitting the theme, I have selected Sanjeev Kapoor's Cakes and Bakes. I will be doing two books, one for the reader and one for the participants. All you have to do is leave a comment on your favorite cake. Coming to the entries, from now until December 20th, blog on your space, any cake, with eggs or eggless, any flavour. It can be a cake, cupcake, muffin, cake pops and Ice cream cakes. The cakes can be baked, steamed or however else one can make a cake. Cookies and other bakes will not be accepted. From now till Decemer 20th 2013, bake a cake and link them in the linky tool! Usage of the logo is appreciated as it helps spread the word. Both Egg and Eggless are are accepted. The post should have a mandatory picture of the dish. Archive entries after August 2013 are accepted, provided it has a link back to this announcement. Any questions, please send them to cooking4allseasons@gmail.com.